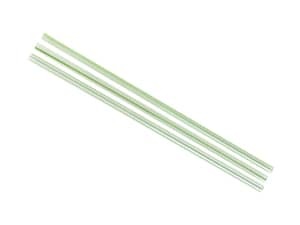 Our clear bioplastic straws are made from PLA, a compostable plant-based material. PLA has 67% less embodied carbon than oil-based PP plastic. These sustainable straws are ideal for drinks up to 40C. Incudes GK107 7mm PLA straw SS07-GS. These compostable disposables from Vegware are designed to be recycled in an industrial composting facility together with food waste. That means there is no need for sorting, and the compostable cup, lid, burger box, knife and napkin can all go together without removing the ketchup and leftover chips. An extra bonus is that once food and disposables share one bin, other dry recycling bins are cleaner and easier to recycle. Combining plastic and card in foodservice packaging creates massive recycling challenges, as highlighted by the recent coffee cup recycling debate. Food contamination is inevitable, so the result is incineration or landfill. For disposables destined for serving food, it makes sense to use materials that can be recycled together with food. With compostable disposables, food is not contamination, it is a vital ingredient in the composting process. Everyone likes the word recyclable, but creates the real challenges of recycling used recyclable packaging. The UK exports 70% of its paper and 66% of its plastic for recycling, with no idea if it actually gets recycled. China took a lot of exported UK recycling, but over the years discovered it is not good enough quality to recycle. Since January 2018, China has banned imports of household plastics, and only accepts cardboard and paper with less than 0.5% contamination. Other Asian countries are considering similar bans, to avoid becoming a dumping ground for unrecyclable waste. Food contamination is a major problem, and the British recycling industry worries that most UK card and paper will not meet new China standards.